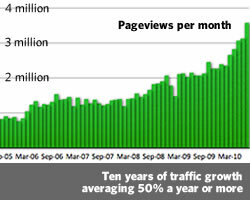 It's not just the volume of our traffic - over 42 million page views a year with 10 million unique users, 85% of which is from the US, Canada, and Europe - that is impressive. It's the fact that we have been growing it at nearly 50% per year for the last 10 years. This sustained growth has allowed us to leverage our strengths to support this newly recognized market. As we grow, we strive to maintain a consistent user experience, responding to user needs and trends as we go and building our properties organically. Our newest sites in development are like nothing anyone has ever seen. We’re only interested in growing our own ideas, not someone else's.